Bio: A lover of writing, reading, the natural world and animals, Sharon is freshly determined to get her writing off her computer and into the world. 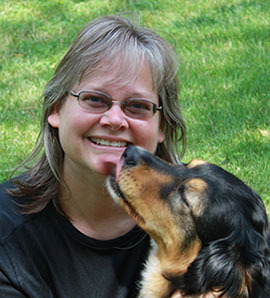 Sharon is a games-based dog trainer near Indianapolis, Indiana, where she lives with her husband, their two children, dogs, cats, chickens and goats. You can learn more about her at sharonhenriksen.com or about games-based dog training at wagnwin.com. WOW: Congratulations on your top ten win in our Spring 2018 Flash Fiction competition! What inspired you to enter the contest? Sharon: Thank you! Though I’ve been writing for many years, I have not been good about submitting my writing for publication. I started attending a writing group at my local library recently, and the librarian in charge has been wonderful about encouraging us to submit our work. When she drew our attention to information about this contest, I was drawn to respond. I actually had to cut about half of my story out in order to meet your word limit, but I think that tightened it nicely without detracting too much from the story. WOW: Can you tell us what encouraged the idea behind your story, "Limber Timber?" Sharon: My husband and I considered adding an attached garage at one of our past homes, but ultimately decided against it due to the fact that we would have had to cut down a large and lovely sycamore tree. Although I actively protect life in as many forms as possible – I’m a vegetarian, don’t use leather products, leave indoor spiders alone or take them outside when my kids spot them, and rarely weed my garden – I do realize that many animals would not hesitate to kill me if they felt threatened. Nature is wonderful – but dangerous at the same time – and I find that an interesting intersection to explore. Sharon: I love writing in the late evening/late nights because most of my daily responsibilities are behind me. I tend to write in my living room with my dogs and a cat or two lying nearby – or on me. Sometimes I’ll write in my bed just before going to sleep or right after waking or showering. I have often found walking to be very thought-provoking. Before children and fostering dogs, daily walks were great for contemplating writing ideas. Now I am more dependent on free writing and other writing exercises for sparking my thoughts. WOW: Your games-based dog training company looks amazing. What do you enjoy most about your business? Sharon: I find games-based dog training extremely meaningful. For years I taught in the academic world, but that didn’t provide the right balance for me. After discovering concept training – which is essentially a more specific, developed, and organized form of how I’ve always related to my dogs – I felt that my inner self and my job came together in new ways. Not only is it an effective method for getting great real-life behavior with dogs, but it really improves the lives of both dogs and owners. Through my Wag & Win business, I am building a wonderful community of people who respect and enjoy their dogs and each other. Concept training seems to attract kind and loving people, and we leave the lessons feeling a renewed sense of joy and optimism in our lives and in our world. I feel lucky to be involved with bringing concept training to my area! WOW: Thanks so much for chatting with us today, Sharon. Before you go, can you share a favorite writing tip or piece of advice? Sharon: I think the idea of separating the creative and editing processes from each other is invaluable. Set the critic aside while you create. It can be really difficult to do effectively, but it is so crucial. The critic plays a wonderful role, but he has to wait his turn. I’ve seen this idea offered in various places and various ways. I think the first time I remember it being discussed was by Natalie Goldberg in Writing Down the Bones. Thanks for the feedback! Glad to know there are others out there like me!